- Top with some mozzarella cheese and sauce and return to the oven. I like to turn the broiler on for a few minutes. The chicken gets nice and crispy, and I especially love the crispy bits of breading and cheese that end up on the bottom of the dish. I served it with some thin spaghetti and sauce (just jar sauce - no time to make my own tonight, although I want to try to perfect a sauce sometime soon). It's not the best picture, but it tasted great! I am definitely going to try this. I like the idea of dredging in oil/garlic first. I bet it gave it a great flavor! Looks great! 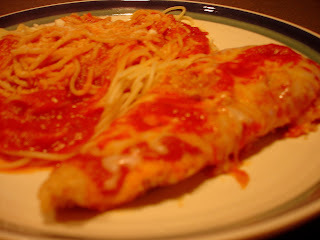 I am making chicken parm tonight, only on sandwiches!